Ellen DeGeneres is one of the most popular contemporary comedians and the host of a successful daytime talk show. She is perhaps best known to young audiences as the voice of the endearing but absentminded fish Dory in the blockbuster animated hit Finding Nemo (2003), a role that perfectly captured her rambling, seemingly unrehearsed comic style. After rising through the ranks of stand-up comedy during the 1980s and early 1990s, DeGeneres became a successful television star with her show Ellen in the mid-1990s. Her career became temporarily derailed in the late 1990s, but she got back on track a few years later, surpassing her earlier successes by a long shot. During 2003 DeGeneres published a best-selling book of short stories and essays, toured across the United States with a new stand-up routine, voiced the part of Dory in Finding Nemo, and launched her syndicated talk show. Displaying the self-assurance that comes from a string of successful career moves, DeGeneres explained to Nicholas Fonseca of Entertainment Weekly how she feels about her latest venture: "I've never been so passionate about something. I will probably do this for the rest of my career." DeGeneres was born outside New Orleans and spent most of her childhood there, living with her parents and her older brother, Vance. As a child, DeGeneres spent much of her free time exploring the city. She recalled to Liz Scott of New Orleans Magazine, "I rode my bike everywhere. All over the campus [of Newcomb College]. All over uptown. You know, people can grow up in New Orleans without realizing how unique a city it is. I remember thinking that it was a really neat place." When DeGeneres was thirteen years old, her parents divorced, and she moved with her mother to Atlanta, Texas. As quoted in the St. James Encyclopedia of Popular Culture, she recalled using comedy to help her mother through the painful period after the divorce: "My mother was going through some really hard times and I could see when she was really getting down, and I would start to make fun of her dancing," DeGeneres remembered. "Then she'd start to laugh and I'd make fun of her laughing. And she'd laugh so hard she'd start to cry, and then I'd make fun of that. So I would totally bring her from where I'd seen her start going into depression to all the way out of it." "I'm doing a talk show. It's not my job to get into an argument with somebody about religion or politics or sexuality or anything. It is my job to make people laugh." After DeGeneres graduated from high school in 1976, she moved back to New Orleans, holding down a series of jobs, none of which suited her personality. She worked for a time in a law firm but felt stifled by the dress code. She held a number of restaurant jobs, from hostess to bartender to oyster shucker. She also worked at a retail clothing store and as a house painter. Ultimately she realized that she did not like following other people's rules, and she would have to make a career for herself that allowed for independence. At the age of twenty-three, she started to flesh out a comedy routine, first performing just for friends and then at local coffeehouses and comedy clubs. Soon she became the master of ceremonies, or emcee, at a New Orleans comedy club. In 1982 she entered a national talent contest held by the cable network Showtime, sending in a videotape of her stand-up act. When DeGeneres won the contest, earning the title of "Funniest Person in America," she went immediately from local New Orleans comic to nationally recognized up-and-coming comedian. Over the next several years, she traveled around the country performing stand-up comedy, and she appeared on several HBO specials. In 1986 DeGeneres made history in her first-ever appearance on the Tonight Show Starring Johnny Carson. Most comedians who appeared on the Tonight Show performed their stand-up routine and then returned backstage, never being invited to sit on the couch and have an on-camera chat with Carson. The invitation to sit down with Carson paid tribute to a comedian's talent and stature. A female comedian had never been asked to sit on the couch after a first-time performance on the show. The night DeGeneres debuted on the Tonight Show in 1986, Carson brought her over to the couch. She had arrived. In 1991 DeGeneres was honored as best female stand-up comic at the 1991 American Comedy Awards. About the same time, she branched out to begin acting in television series. She appeared in a couple of short-lived sitcoms, Open House and Laurie Hill, before earning her own show. These Friends of Mine premiered on ABC in March of 1994, receiving mixed reviews and decent ratings. The show starred DeGeneres as Ellen Morgan, an employee (and later owner) of a bookstore called Buy the Book. It focused on the lives of Ellen and her friends, finding humor in the mundane, everyday events of the characters' lives. By the beginning of the second season, the show had undergone major changes, including its title, which became Ellen. The reviews and the ratings steadily improved, as more and more viewers connected with DeGeneres's oddball humor and appealing, average-gal persona. DeGeneres earned numerous nominations for Emmy Awards, and in 1997 she won the prestigious Peabody Award for her work on the show. In the spring of 1997, DeGeneres made pop-culture history by having her character come out as a lesbian, becoming the first gay lead character on a network television sitcom. That show, called "The Puppy Episode," garnered forty-six million viewers and brought DeGeneres an Emmy Award for best comedy writing. At the same time, DeGeneres herself came out to millions with a cover story in Time magazine announcing that she is gay. The announcement came as no surprise—fans and journalists had speculated that it was coming—but it still generated a media storm. Many fans wrote supportive letters, while others were scandalized by the news. During the 1997–98 season, Ellen began losing viewers. Many observers suggested that the show had fundamentally changed when the main character's sexual orientation became the focus of numerous episodes. Some believed that the network simply did not want the controversy generated by the announcement about Ellen's sexuality. Some major advertisers had pulled out, and the network, fearful of offending viewers, began attaching warning labels to episodes that showed Ellen kissing another woman or discussing her sexual orientation. The show was cancelled after the 1997–98 season. After her show's cancellation, DeGeneres went through a difficult period, both professionally and personally. Her highly publicized relationship and August of 2000 breakup with actress Anne Heche (1969–) eroded much of the goodwill fans felt toward her—or at least that is what DeGeneres believed, as she explained in an article in People magazine: "I went through a phase, whether it was true or not, where my perception was, 'Everyone hates me now,' and it felt horrible." She appeared in a number of films during this period, including EDtv and The Love Letter, but none of these established her as a successful film actress. In 2001 DeGeneres starred in a short-lived sitcom called The Ellen Show, which was praised by reviewers but never attracted a large audience. From left, Christiana Aquilera, Molly Shannon, and Ellen Degeneres, during a taping of The Ellen Degeneres Show . tragedy. As many in the entertainment industry struggled over how to amuse audiences—or whether they should even try—in the somber aftermath of 9/11, DeGeneres impressed her fellow actors and millions of viewers with what Fonseca described in Entertainment Weekly as a "witty, respectful, and wise" performance. Over the next year or so, DeGeneres began showing up on television more and more often. She hosted Saturday Night Live, appeared on an episode of Will and Grace, and occupied the center square on the primetime game show Hollywood Squares. Suddenly, in 2003, DeGeneres was everywhere. She returned to stand-up with a hugely successful thirty-five-city tour, culminating with an HBO comedy special called Ellen DeGeneres: Here and Now. She published a best-selling book of comic essays called The Funny Thing Is..., and she lent her voice to what became the highest-grossing animated movie of all time: Disney/Pixar's Finding Nemo. The character of the blue tang fish Dory seemed tailor-made for DeGeneres's wide-eyed, naive, and intensely likable persona, and in fact the role was written expressly for her. In a September of 2003 article in Entertainment Weekly, Andrew Stanton, the film's director and cowriter, explained why DeGeneres was his only choice for that character: "Everybody has that friend who's funny merely for existing. That's Ellen. You're not waiting for a punchline with her. You're just waiting for her to speak so you can start laughing." In the fall of 2003, DeGeneres found herself once again at the center of a self-titled television program; this time she was not the star of a sitcom but the host of a syndicated daytime talk show. 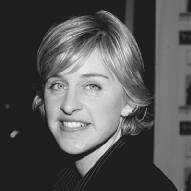 In its first season, The Ellen DeGeneres Show earned positive reviews and solid ratings across the nation. The successful year was topped off with a record twelve Emmy Award nominations in 2004, the most ever received by a talk show in its debut season. According to an article in the Washington Post, when she heard the news about the Emmy nominations, DeGeneres responded with a comment typical of her self-criticizing, slightly insecure comedic style: "They told me, you got nominations for every single category except the song, and I instantly said, 'What's wrong with our song?'" In addition to three technical awards, DeGeneres's program won the 2004 Emmy for outstanding talk show. Basking in a post-Emmy glow, DeGeneres commented in an article at CNN.com: "I have fun every day. It's the best job I ever had." The joys of DeGeneres's professional successes are underscored by her stable and happy personal life. She has spent several years in a relationship with photographer and actress Alexandra Hedison. The two share a home on a three-acre spread in the Hollywood Hills. In a late 2003 article in People, DeGeneres reflected on her career, concluding that both the highs and the lows have been valuable to her: "Right now I'm in such a good place, and I'm so grateful for every step of the way, because it makes me appreciate this time even more." St. James Encyclopedia of Popular Culture. 5 vols. Detroit: St. James Press, 2000. Blumenstock, Kathy. "DeGeneres Attempts to Give Her Viewers a 'Sense of Fun.'" Washington Post (May 16, 2004). Fonseca, Nicholas. "The New Queen of Nice." Entertainment Weekly (September 12, 2003): p. 112. Scott, Liz. "Ellen DeGeneres." New Orleans Magazine (July 1994): p. 68. Tauber, Michelle, and Julie Jordan. "Look Who's Talking." People (November 10, 2003): p. 93. "DeGeneres, Brady among Daytime Emmy Winners." CNN.com. http://www.cnn.com/2004/SHOWBIZ/TV/05/22/daytime.emmys.ap/ (accessed on June 26, 2004). The Ellen DeGeneres Show. http://ellen.warnerbros.com/ (accessed on June 26, 2004). Way to go Ellen, your awesome person. I watch you when I get home from college. I am so lucky that you're on twice a day. So on three mornings I miss the first showing, but that's when I get to see you again in the afternoon, before I have to go and pick up my son at the day care. Keep up the good work. I don't have a lap top or computer at home as I'm still in the stone age and I don't have a cell phone either. I am doing a paper on a person that is inspiring to me and so I pick you Ellen. I'm working on my way up to get my grade twelve English. As my schooling was very much different, back at home and I'm don't know where I belong sometimes. Anyways keep up the awesome work. Catriona Charlie. wow ethan very nice. i just thot i sued tall you as well. your comment inspired my a lot, it almost brought a tear to my eye.